On Sunday, May 3rd, HUECU members and staff volunteered their artistic abilities for Cambridge Rotary Club’s Annual Spring Fundraiser: Chalk on the Walk at The Harvard Square MayFair. 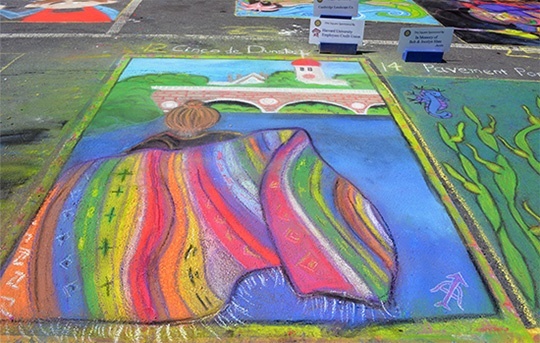 Chalk on the Walk is the Cambridge version of an Italian Street Painting Festival and is one of the many interesting activities that make Harvard Square MayFair a destination for over 100,000 people on the first Sunday in May. HUECU members and staff, who met at an extension school art class last fall, created the team coined: The Bow and Arrow Press Girls, after the letterpress studio where they met located in the basement of Harvard’s Adams House. The day started off bright and sunny and the heat lingered as the artists tackled HUECU’s 7’ x 9’ square until final judging commenced at 3pm. The Bow and Arrow Press Girls took home a prize for People’s Choice Award, voted by the thousands of visitors who attended the fair. Their work seen below was entitled Cinco de Dunster. The proceeds from the event help the Rotary Club support college scholarships and Cambridge service organizations throughout the year. For complete photos of Cambridge Rotary Club’s 2015 Chalk on the Walk please click here.